Comedy is a genre that’s almost everybody’s favourite. Bollywood has given us some amazing fun and funny, hilarious comedy movies. We have spent hours watching movies for a great belly laughing, tear producing, knee slapping good time. These are the movies that we don’t mind watching them again and again…. Here are some of the best bollywood comedy movies…. 1. 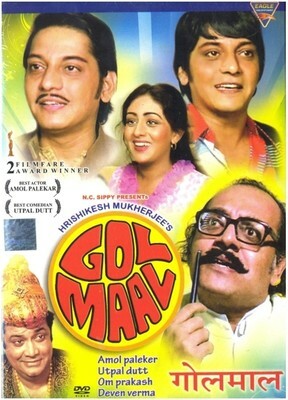 Gol Maal : This 1979 movie, directed by Hrishikesh Mukherjee is regarded as one of the classic comedies of Indian cinema. The film stars Amol Palekar, Utpal Dutt, Bindiya Goswami and Deven Verma. 2. 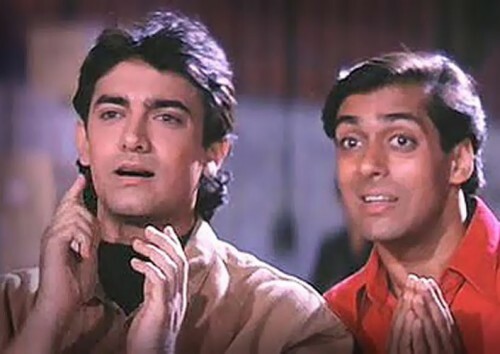 Andaz Apna Apna: Released in November 1994, Andaz Apna Apna is one of the cult classics of Indian cinema and its fan following has only increased over the years. From dialogues to characters, the film is exemplary in more ways than one. Directed by Rajkumar Santoshi, the film stars Aamir Khan, Salman Khan, Raveena Tandon, Karisma Kapoor and Paresh Rawal in lead roles. 3. 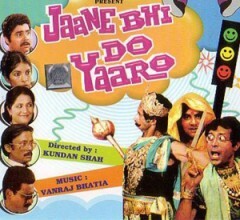 Jaane Bhi Do Yaaro: This is a 1983 Hindi film directed by Kundan Shah. It is a comical satire on the corruption with a stellar cast of Naseeruddin Shah, Ravi Baswani, Om Puri, Pankaj Kapur, Satish Shah Bhakti Barve and Satish Kaushik. Mindboggling Draupadi cheer-haran scene to numerous dialogues, the film is a cult classic. 4. Padosan: Released in 1968, Padosan is a story of a simple village guy (Sunil Dutt) who falls in love with his neighbour Saira Banu. To woo her, he enlists the help of his musical-theatre friends. The film has some of the most famous comedians of its time – Kishore Kumar, Mehmood, Mukri, Raj Kishore and Keshto Mukherjee. Mehmood’s famous song “Ek chatur naar” is a hit till date. 5. 3 Idiots: 3 Idiots is a hilarious masterpiece ‘3 Idiots’ with Aamir Khan, Sharman Joshi and R Madhavan in lead roles. Directed by Rajkumar Hirani and produced by Vidhu Vinod Chopra, the film is not only high not only on humour and fun but also conveys a strong message. It encourages us to follow our real passion rather than doing something that is considered to be good by the society. 6. Welcome: Anees Bazmee’s ‘Welcome’ starring Akshay Kumar, Nata Patekar, Anil Kapoor, Katrina Kaif, Mallika Sherawat and Paresh Rawal is one of the most loved comedy films is about a don’s search for the perfect suitor for his sister. 7. Angoor: Sanjeev Kapoor and Deven Verma were seen in dual roles in 1982 comedy ‘Angoor’,which is an adaptation of Shakespeare’s play ‘The Comedy of Errors’. The movie is a super hit comedy that revolves around mistaken identities. Superb performances with confusion galore, Angoor is a movie that you can watch any time any day. 8. Puspak : Released in 1987, Puspak is a dark and silent comedy. The film stars Kamal Haasan, Amala and Tinnu Anand. Directed by Singeetam Srinivasa Rao, the film received the National Film Award for Best Popular Film Providing Wholesome Entertainment. 9. Chashme Baddoor : Chashme Baddoor is a 1981 romantic comedy film. The plot revolves around three students, Farooq Shaikh, Rakesh Bedi and Ravi Baswani who are studying at Delhi University. During their summer vacation, they meet a girl (Deepti Naval) and try different tricks to impress her. 10. 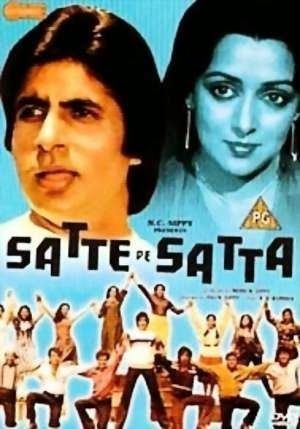 Satte Pe Satta : An action-comedy film released in 1982, Satte Pe Satta is the story of seven brothers. Ravi (Amitabh Bachchan) is the eldest of seven brothers. 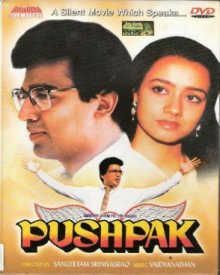 He falls in love with Indu (Hema Malini) and then begins the fun series of events of their journey from unkempt, ill-mannered brats to sophisticated, clean beings. 11. Chupke Chupke : Released in 1975, this film is one with fantastic rib tickling comedy. Dharmendra portrays the role of Professor Parimal who becomes a driver Pyaremohan as part of a prank. He speaks only in pure Hindi, and with Sharmila Tagore he creates a hilarious comedy of errors. 12. Munna Bhai M.B.B.S. 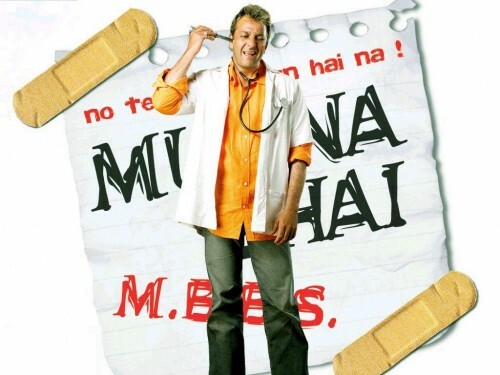 : Munna Bhai M.B.B.S. is a 2003 comedy film directed by Rajkumar Hirani teaching an important lesson of “Gandhigiri”. The plot revolves around a goon who goes to a medical college to fulfil his father’s dream of becoming a doctor. The film stars Sanjay Dutt, Arshad Warsi, Jimmy Shergill, Sunil Dutt, Gracy Singh and Boman Irani. Which are your favorite Bollywood Comedy Movies, do share in the comments section. Keep enjoying Chatpata Bollywood till then!